Quality Solar Inverters Delivered to Your Door - FREE Delivery! Not anywhere near the Gold Coast or Brisbane area? No worries! We can’t personally install your inverter for you but we can send a quality replacement inverter with FAST delivery straight to your door. Why purchase an inverter from us? Who should install my new inverter? Any electrical work performed in Australia must be carried out by a licensed electrician and replacing your solar inverter is electrical work. As replacing a solar inverter does involve dealing with dangerous solar DC voltage we highly recommend that your new inverter be installed by an electrician who is also a CEC accredited solar installer. Click here to find a local CEC accredited solar installer to install your new solar inverter. Your new inverter will be covered by the manufacturer warranty which begins on the date of installation. Make sure that you receive a dated invoice from your installer and keep this on record in case a warranty claim is ever required. What inverter is best for my system? The replacement solar inverter that we recommend to you will depend on a number of factors mainly based on information we can gather from the type of inverter you currently have installed. You can look at installing a larger inverter but please be aware that doing so may void your solar feed in tariff and will require prior approval by your local power company. It’s certainly much easier to just replace the faulty inverter with a “like for like” replacement model of the same power capacity and topology to avoid any potential issues. For more information on the quality solar inverters we recommend please check out the following: Quality solar inverters recommended by Gold Coast Solar Power Solutions. 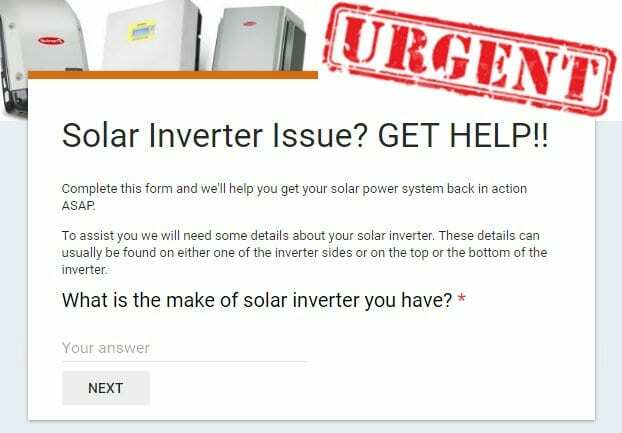 To organise an appropriate replacement solar inverter delivered FAST to your door please call us on 07 55 228 980 of fill out the form on this page, we will be in touch ASAP.